In this Max for Live Roundup we take a look at some free Max for Live devices that add usefulness and spice to your Ableton Live projects. The devices range from synths to utility devices that override Live’s default settings. 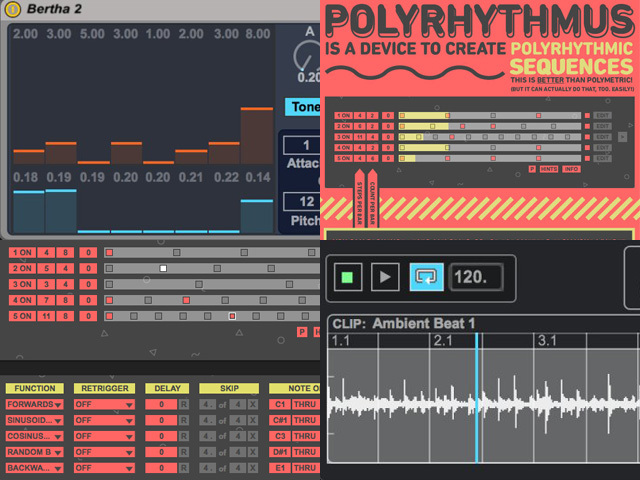 Polyrhythmus by Benniy C Bascom is “a modular, euclidean sequencer, arpeggio-builder and a lot more.” Well that is true because there are a lot of features in this device. At its core it is a 5 step sequencer that can play independent rhythms (5 beats over 8 beats) at different time signatures (5/4 over 4/4). The “lots more” comes in where Polyrhythmus gives you control features like arpeggiating CC numbers for outboard gear, note reordering functions, mapping of parameter to get polyrhythmic automation and a presets tab to save up to 18 different variations on your sequences. It may take a moment to wrap your head around the musical possibilities, so watch the video and download Polyrhythmus for free. Keep Follow On by Dennis DeSantis is one of the simplest devices you can come across. When enabled, this device will keep Ableton Live’s follow button on. Usually when you turn follow on and are zoomed in, the view of the clip will be updated to the location of the playhead. When you re-zoom the clip or arrangement, “Follow” turns off and you will have to press “Follow” again. Keep Follow On works “even when zooming or scrolling within clips or the Arrangement,” as Dennis says. Download Keep Follow On free app for a stress free follow. Mashup by Ned Rush by is another device that does one simple task very effectively. “Mashup is a chance based sound editor for beat based edits, mangles and mashups in pure Ned Rush style.” When you drop in a loop, Mashup mangles it based on chance of time and mangle types. You set slices and the probability of those slices. Then set probably of the re-triggering time of said slices. Lastly you can set probability of the type of playback the Mashup will choose like forwards, slow back and pitch stop. Gratis Hits by Max for Cats is a bundle of 5 unique Max for Live devices that be added to sooth some of your sonic and utility needs. Bertha 2 is an additive synth that can sounds similar to a Farfisa or Vox transistor organs. Bundled in Bertha 2 is a Leslie organ simulator that can go, sonically, into territory the original can’t touch and the simulator weight a lot less. XY Gesture (Audio and MIDI) is a nice device you can use your mouse to automate two parameter on the XY-pad. When you finish, it can loop the playback of that automation. Anti-Warp is a great tool play a clip and loop it without having to use Warp. You can have just your unwarpped clip play or use the dry/wet to blend with warped clip, also available are start and end parameters as well as playback speeds that will range from -3x to 3x. MIDI Monitor displays what is going on under the hood of your MIDI tracks. MIDI Monitor shows you the note on/off, CC and pitch bend information. You can freeze the data to pinpoint important incoming data and it even has a cool animation overly to entertain you for a great break from the technical aspects of reading MIDI. Use this device to help with your Max for Live development or troubleshooting your hardware devices. There is something for everybody in this free bundle.